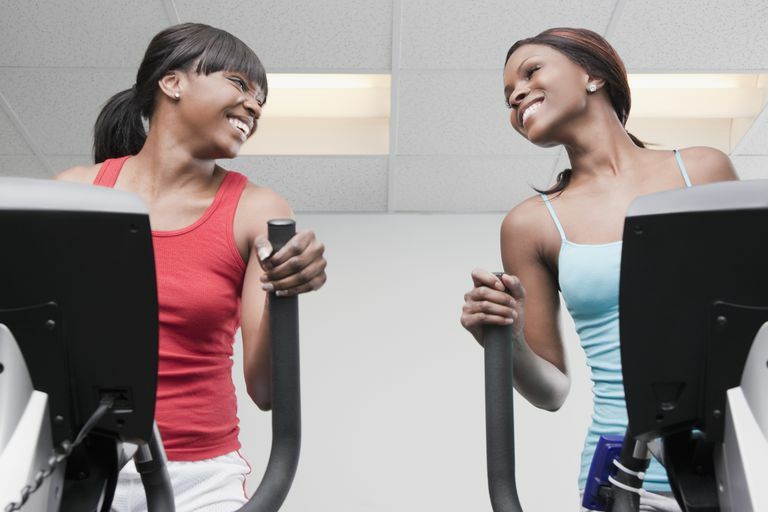 Have you noticed how many elliptical trainers are at your local health club? Ellipticals offer the benefit of a low-impact workout while exercising both your upper and lower body. They are particularly appealing to an aging baby boomer generation. Elliptical trainers can be forgiving to aging joints while giving you a good aerobic workout and helping you burn calories for weight loss. Explore seven benefits of using elliptical machines. Elliptical trainers reduce the stress and strain on your legs through an elliptical motion. Your feet never leave the pedals. It is like walking in midair. In comparison, when you walk or run, every step causes a jolt to your body. It is suggested that runners impact up to 2.5 times their body weight. This affects not only the joints in your legs but also your lower back. While walking has less impact, the elliptical is better still. In addition, there is no reverse action. The shape of the elliptical movement mimics the natural path of the ankle, knee, and hip joints during walking, jogging, or running. To further reduce the strain on your joints, many elliptical trainers are equipped with articulating foot pedals that conform to your stride. Not only do your feet never leave the pedal, but also the pedal adjusts to the angle of the elliptical stride. In comparison to a fitness machine like a stationary bicycle, an elliptical trainer provides a weight-bearing exercise. Weight-bearing exercises are important to inhibit the onset of osteoporosis. What makes an elliptical trainer unique is the combined upper and lower body workout. In fact, there is no other fitness equipment that simultaneously works as many muscle groups. That is why many refer to an elliptical as a cross-trainer. With an elliptical trainer, you get a workout that utilizes the quadriceps, hamstrings, glutes, chest, back, triceps, and biceps. To get the full benefit of the dual action workout, it is important that you distribute the resistance between your upper and lower body. Many people who exercise on an elliptical trainer place most of the resistance on their lower body and only go through the motions with the upper handlebars. Don't make that mistake, ensure that you get good upper body work. The obvious benefit from exercising more muscles is that you tone more of your body. Furthermore, you also optimize your energy expenditure. You end up burning more calories and fat in less time. It is also suggested that there is a reduced perceived rate of exertion with an elliptical workout. You are actually exercising harder than you would normally perceive. Like a treadmill, elliptical trainers are equipped with a variety of challenging exercise programs. These programs mimic hill climbing or interval training through alternating resistance. Many ellipticals are also equipped with wireless heart rate control, which allows you to optimize your workout by letting your heart rate control the resistance level. A benefit of an elliptical trainer over a treadmill is reduced maintenance. Due to the low-impact elliptical motion, and because of fewer moving parts, an elliptical trainer is less likely to require service. You do not have to worry about belts, motors, rollers, and bearings burning out. Is there a drawback to an elliptical trainer? Yes, some people find the dual action elliptical exercise awkward and are more comfortable simply walking or jogging on a treadmill. Some models of elliptical trainers have a set width for the pedals that may be a wider or narrower stance than feels comfortable. For many people, it is the dual action workout that makes an elliptical trainer so appealing. If you have not tried an elliptical trainer, get to your local fitness equipment store and give it a test. Better yet, pay for a day pass at a health club, and put one through a strenuous workout. See if you notice a difference. Then stop and consider everything you want in a model before you buy an elliptical trainer. Research the top picks for elliptical trainers to find good models for your home gym.